If you are an event organizer, producer, or promoter, learning how to create well-designed concert tickets is a must. Use this short article as a guide for you and your team in making sure that your contracted event goes according to plan—starting from your use of relevant ticket designs. We have also embedded examples of concert ticket templates that you can download and use for your own concert events. Listed below are the steps to making a concert ticket. Study each step so that you will familiarize yourself with the entire ticket-making process. Step 1: Choose a design theme or motif. It’s important to first choose an overarching theme or motif for your concert tickets. This design theme should coincide with the artist’s image, the type of concert, and other qualities of the audience or concert-goers. 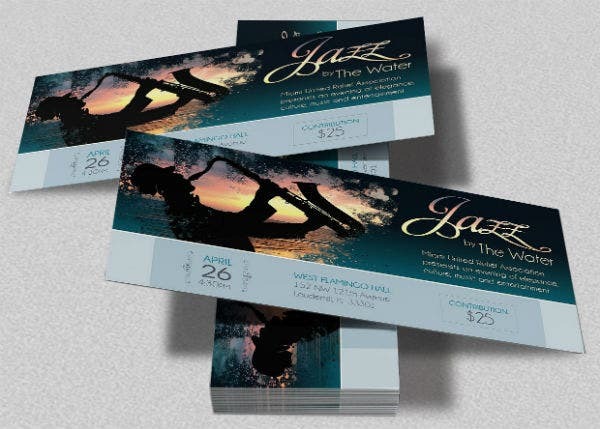 For example, if you are planning a classical music concert, you may use a black tie ticket template design. Step 2: Write down all the concert details. 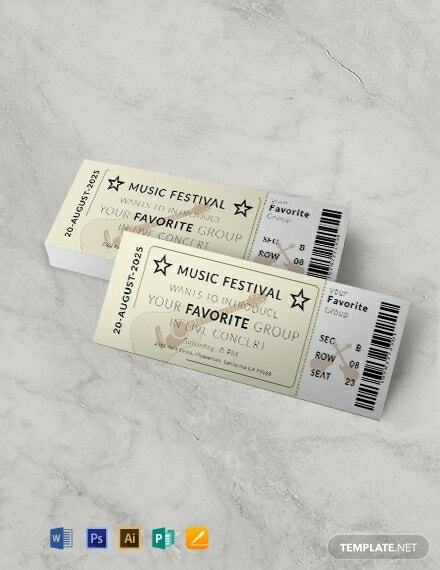 After choosing a ticket design theme, you should begin writing down all the concert details that you wish to include on the printed tickets. This may include the artist’s name, the name of the concert, the date and time, the venue of the concert, the ticket cost, and the assigned seat number or section. You may also take note of the terms and conditions of the use of such ticket. Step 3: Compile all the relevant images and/or illustrations. Next, it’s time to save all the relevant images or illustrations that you want to include on the ticket design. For instance, if you are producing a charity country music concert, then you may consider adding the artists’ photos and other design elements that exudes rustic or vintage feels. Or, you may even use the vintage concert ticket template. Step 4: Download and edit a printable ticket template. 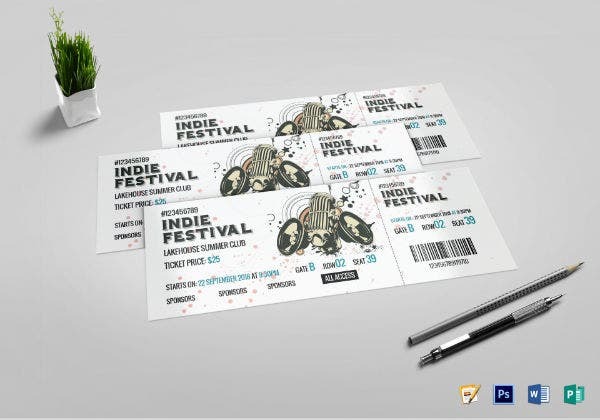 Once you have compiled all the text and visual elements for your ticket design, you should start downloading a printable ticket template. Using these pre-made files allow you to cut down on the time and effort spent in making your own ticket design. After downloading, begin editing the ticket template using your preferred graphic design software. Don’t forget to incorporate all the text and graphic design elements you have gathered earlier. Step 5: Print the template. You can then begin printing your ticket designs once you have finalized the template customization. For more durable printed tickets, make sure to use high-quality and thick cardstock or paper. Keep all these steps in mind and you will have beautifully printed concert tickets later on. Shared below are downloadable concert ticket templates in MS Word, Apple Pages, Illustrator, Photoshop, and Publisher file formats. Choose a template file format that is most compatible with your own editing software. The Music Concert Event Ticket Template (shown above) is a stunning blank ticket template that uses a black and red color scheme—making it suitable for most formal concert events. It is also available in DOC, Pages, AI, PSD, and PUB template file formats. 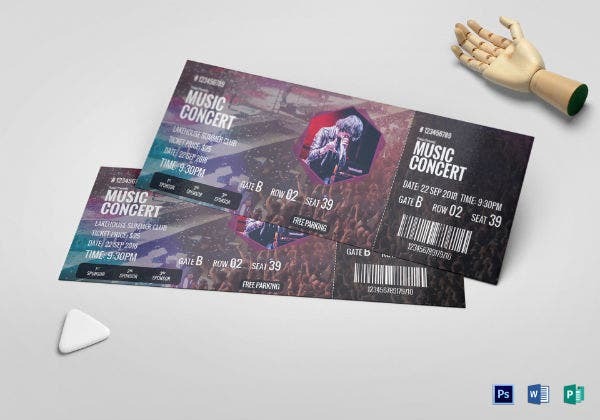 The Concert Ticket Voucher Template (featured above) works both as an admission ticket and as a voucher ticket design template. When using this editable template, make sure to replace the built-in background photos with images of the actual artists or venue of the concert. Planning a concert wedding reception? Then the Concert Ticket Wedding Invitation Template (embedded above) will work wonders for your event. 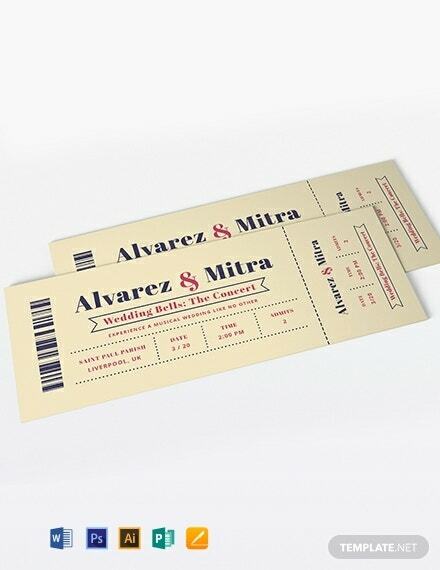 If used as part of a wedding event, make sure that this ticket template is customized to match your own wedding motif. This template is also available in multiple file download formats so make sure that you have the right editing software install prior to downloading the file. 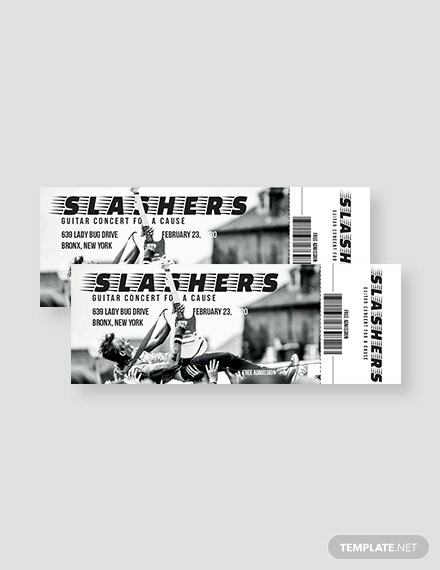 The Festival Concert Ticket Template (pictured above) sports a quirky and organized template design. It is ideal for musical or indie concerts. 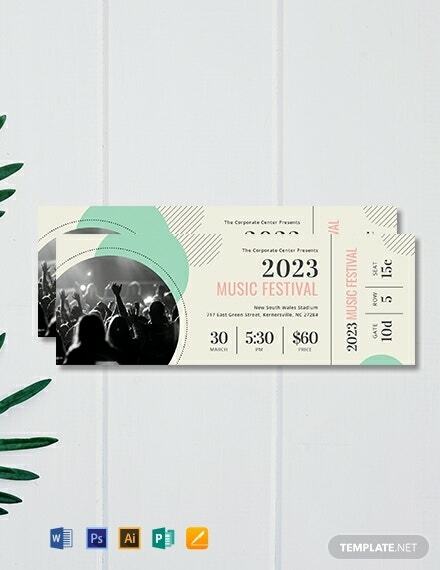 For best results, print this elegant ticket template on high-quality paper or incorporate advance printing techniques like foil and embossed printing. 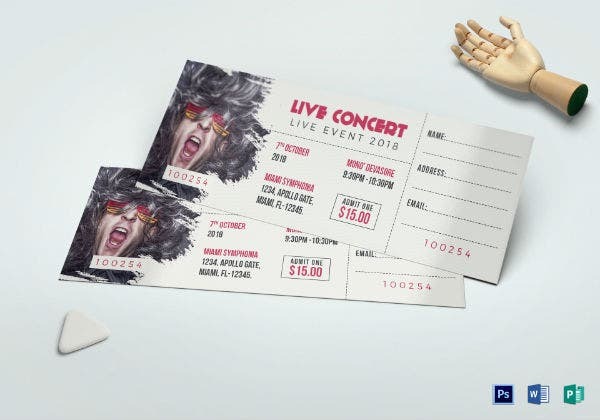 For those who want a focal artist or band photo in their concert ticket design, try out the Live Concert Ticket Template (shown above). As an editable template, you may resize the sample ticket template file to fit different paper sizes. You may also modify the template’s color scheme and choose something that best represents the kind of concert you are planning. Concert tickets are most enticing when they depict a realistic representation of what will occur during the concert. The Music Concert Ticket Template (featured above) can help you do that. 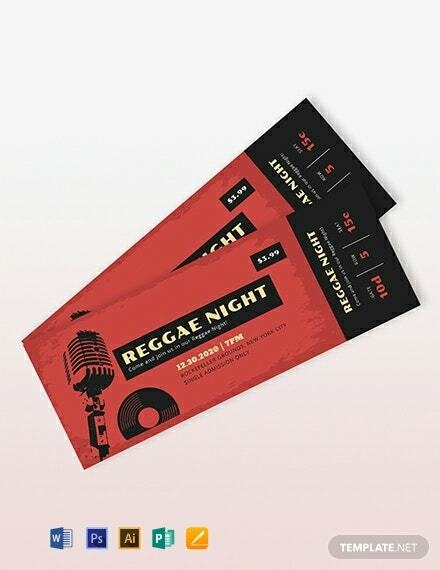 This is a full-color music ticket template design that you can modify according to your preferences and business needs. Tip: Use high-resolution images to ensure that they print out well. 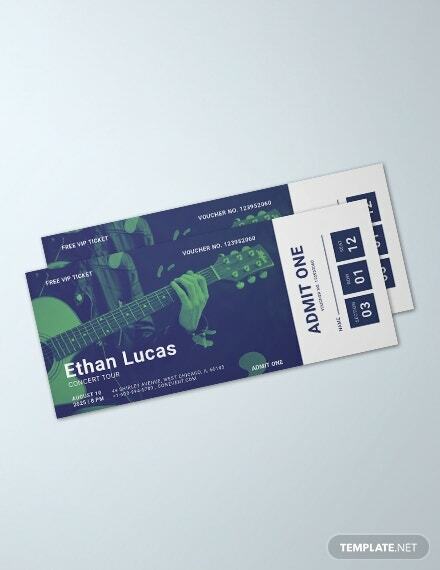 Make any guitar or acoustic concert more memorable when you use the Concert Admission Ticket Template (pictured above). This template sports a black and white color palette but end-users can easily customize it to match their concert’s theme. Tip: To save on paper or cardstock when printing, combine two to three ticket designs on one regular paper. The Modern Concert Ticket Template (featured above) may be used for different kinds of music concerts. It is fully editable so end-users can easily personalize the built-in text and image placeholders to match their concert’s artists or bands. If you wish to change the template’s current color palette, make sure to consult a color chart first. This way, you can determine which color combinations will work best for your ticket design. Use the Printable Concert Ticket Template (pictured above) if you prefer a simple yet classy ticket design. 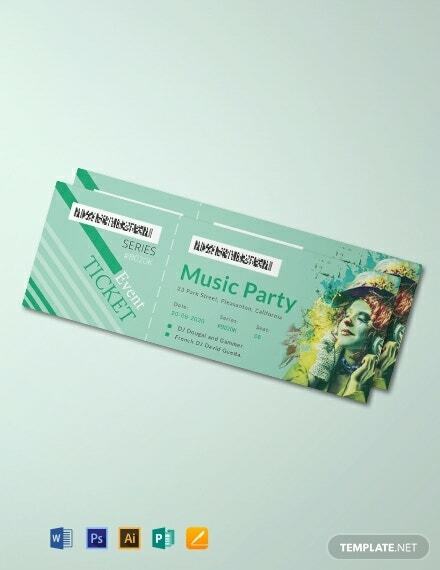 This ticket design works best as an entry ticket design for those planning laidback concert parties, beach-themed events, and other pop music concerts. To further improve this ticket design, you may add a barcode design and decrease ticket scalping incidents for your event. Use the Vintage Concert Ticket Template (embedded above) if you prefer a minimalist ticket design. With this ticket template, you do not need to add photos or illustrations. You just have to make sure that you provide the accurate and most updated concert event details. Whether you are operating a jazz club or it’s your first time organizing a jazz concert, the Jazz Concert Ticket Template (featured above) will be useful for you. This ticket design comes in four color variations. Choose one that best reflects the mood you want for your jazz concert event.